Corning, CA. 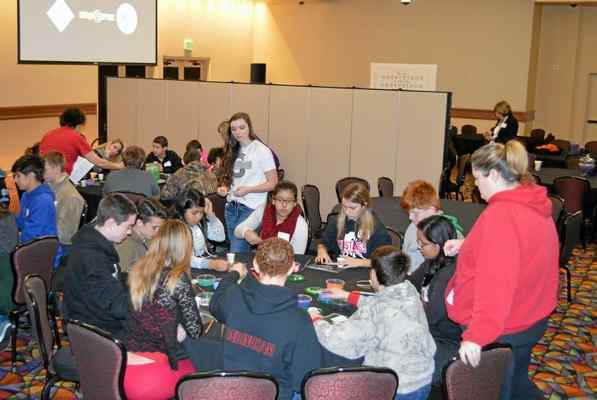 Nearly 800 Tehama County eighth-graders were invited Thursday to join the third annual Leadership Day at the Rolling Hills Casino event center, with five local schools participating. This seven-day college preparation workshop event, put on by the Tehama County Department of Education, California GEAR UP — Gaining Early Awareness and Readiness for Undergraduate Programs — Tehama County high schools and College Options, has continued to engage students with workshops to help guide them through the next four years and beyond. The schools that participated Thursday were Richfield School, Tehama eLearning Academy, Lincoln Street Independent School, Reeds Creek School and Vina School. A few Mercy High School students participated as well by talking with the eighth-graders and sharing their own insights and experiences to help the students with the transition to high school, Morehouse said. One workshop, the true colors personality assessment, had students choosing a particular card with a picture and a photograph that best suits their personality traits. The students were able to share what makes them unique and discuss that with a group of other students, Morehouse said. Learning all the classes needed to prepare for college was another workshop that provide the students with a beaded key chain to remind the students of the core A-G classes needed. Another workshop helped students identify what they are doing now to prepare for college with a bingo game. The goal of the workshop was to show how the items on the bingo sheet can be attributes the students can continue to strengthen for the preparation of college. One student said he gained a better understanding of what to expect in high school and how to prepare for college, his adulthood and his future careers. His favorite subject is math and he hopes to graduate high school near the top of his class. At the end of Leadership Day the students got together and wrote their goals on a paper that was shaped in a thought bubble. The students will keep one with them to remind themselves of those goals and the other will be given to their teachers for them to understand the goals of their students, Morehouse said. On the wall behind the workshop groups where quotes from celebrities showing how far you can go with positivity and urging that with the right resources you can be successful in anything you want.